Add this 12 Oz. 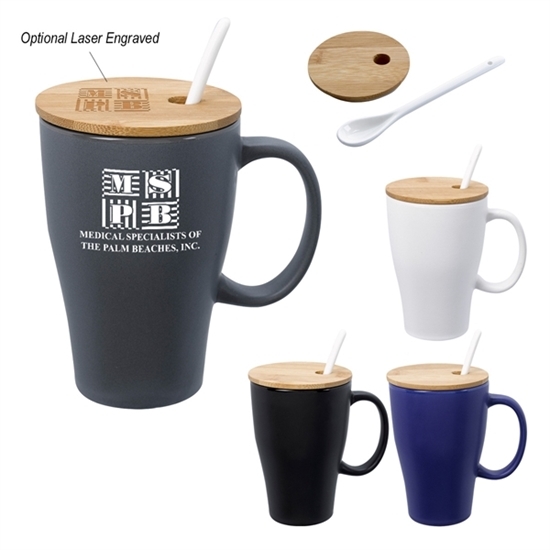 Spooner Mug With Bamboo Lid to your marketing campaign to raise interest in your brand! Hand wash is recommended and it meets FDA requirements. It's available in four bold product colors and comes with a bamboo lid and removable spoon. Add your company's name, logo and advertising message before handing it out at tradeshows, expos, conventions and other promotional opportunities to extend your reach throughout your target audience! Imprint Area: 2 1/2" x 1"; 2" x 1 1/4"